Our Honourable Chief Minister Dr Puratchi Thalaivi AMMA granted permission during the year 1995 to the Tiruppur Co-operative Housing Society Ltd No.K.1917, Tirupur to start the college and it is affiliated to the Bharathiar University, Coimbatore. 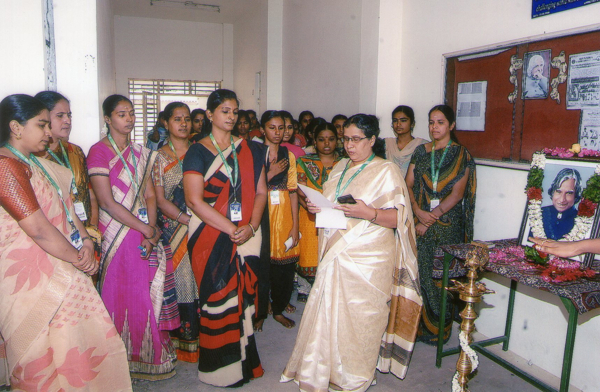 The college aims to impart quality education, which would inculcate virtues of creation, encouragement & sacrifice,it stands out magnanimously as the pioneer college for women in india run by a Co-operative Housing Society. We impart affordable quality education with Social, Moral. Ethical and Cultural values to empower rural women-folk through inculcating Knowledge, Attitude and Skill based learning.